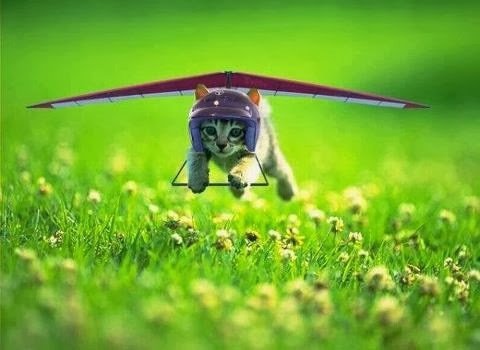 Cute and Funny Pictures and more: Even Cats want to Fly! Kitten hang gliding. Even Cats want to Fly! Kitten hang gliding. Okay, I know this is photo-shopped but it is still cute. I have seen the original picture of this kitten leaping through the flowers and it is adorable all on its own. Adding in the hang glider does make it funny. Kitty cat has a teddy bear on its paw! I am cute and I know it puppy pose.